I was responsible for the research, strategy, ux and user testing. The final product on desktop and mobile. Pre-workout state. Visual design by Juan Millan. To be frank, our biggest obstacle was tech debt and a general lack of backend infrastructure. We had ambitious design concepts and goals but lacked the APIs, databases and suggestion engines we needed. To get an MVP off the ground, we’d have to get realistic. Also, the business was focusing mostly on projects that had an immediate ROI. Personalization wasn’t considered something that would immediately move the needle. So if we were to get anything into a dev sprint, we would have to a) keep it simple and b) make a strong case for it’s impact on revenue, especially in retention numbers. 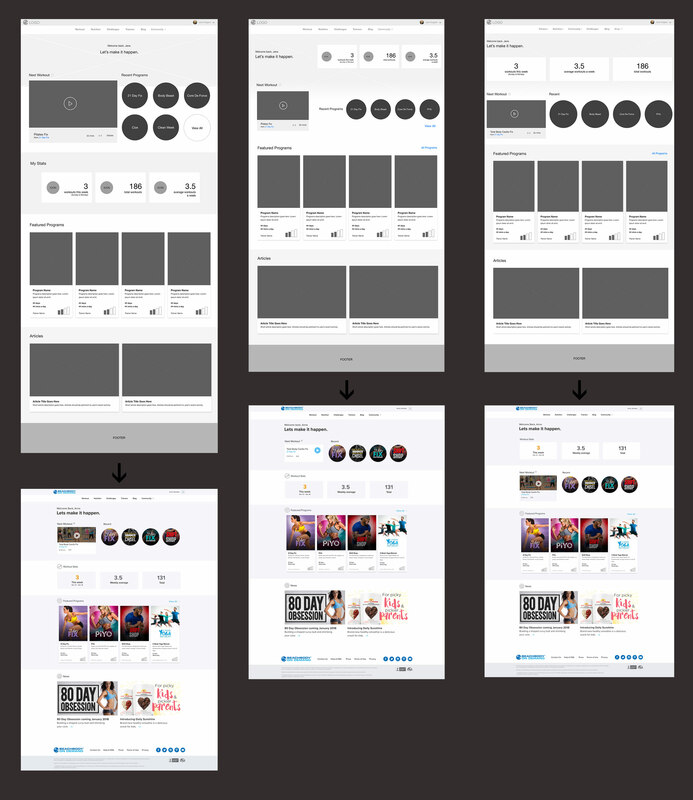 A wealth of self-submitted user feedback (via Usabilla) gave us a solid initial understanding of what features users wanted, while analyzing the way users currently interact with our content gave us a strong understanding of what users actually needed. Users were all but screaming for calendaring, a way to keep track of the workouts they’ve done and what they’re scheduled to do that day. At the time, users had to download a calendar PDF and track their workouts in meatspace (so medieval, I know). They would then have to go to the program page, scroll through and find the workout for that day. Obviously it was easy to improve upon this. When reviewing site analytics, it became clear roughly 70% of users were loyal to one program at a time, however users were generally not finishing programs. Also, of the users who finished at least 75% of a workout, a little less than half were sticking around to view content on the BOD blog. Not surprisingly, the articles were usually directly related to that user’s program or nutrition-based. The next step in our research was to conduct light market research and competitive audits. (We had a firm grasp of what features we needed to tackle; this was more to build a case with stakeholders.) Direct competitors, like Daily Burn, provided some form of calendaring but no user stats or any way for a user to track their progress. Other streaming services like Netflix and Hulu made a best guess at a user’s next episode or movie and naturally placed it at the top of the served suggestions. First pass at wires and mocks. Visual design by Juan Millan. Over two thirds of our traffic is on desktop, so that’s where we started. For this MVP, we had to stay light, so we focused only on the home page. Getting a user to their workout was priority #1. The issue was we didn’t have a foolproof way to determine where a user was in their calendar or even if they were sticking with one program. The only data we had at the time was what workout they’d last completed. So while we were confident we could make an educated guess for most people, we had to account for the users with whom we’d inevitably get it wrong in this MVP stage. (We were ok with the possibility of failing fast but if we did, we wanted to do so intelligently.) To serve these edge case users, we had to have fail safe options, meaning easy access to the other programs they’ve recently viewed. We knew the product roadmap was long and windy so we needed a flexible system that would allow for future features and releases. We also wanted to keep it modular to allow for future personalization for different user states. Counter to my intuition, people preferred to first see their stats before anything else. They found it more personalized and motivating. Luckily, people were happy with the very basic stats we were able to provide, but naturally it piqued interest in more robust tracking like for weight and measurements. It was important to be transparent why we were suggesting a workout, hence an explanatory tool tip. 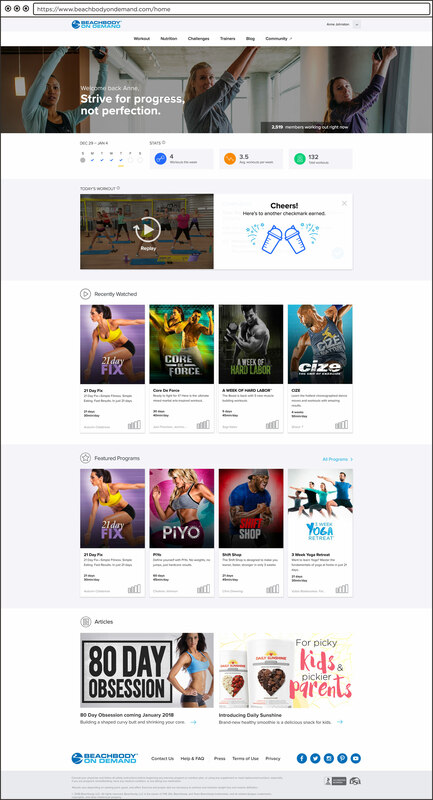 Users absolutely wanted to see some kind of visible calendar and a way to celebrate completing a workout. Over the next 3 rounds of user testing we further refined and validated. We included a weekly calendar view showing how many times a user has worked out (number of weekly workouts is a common user goal). We designed a congratulatory post-workout experience that brought in that necessary element of delight. The final product on desktop. Pre-workout state. Visual design by Juan Millan. Post-workout state. Visual design by Juan Millan. The MVP BOD personalized experience is scheduled to launch March 2018. After we go live we have a number of A/B tests to run on current content. Barring any other necessary game-time decisions, and depending upon back end upgrades, we’re on course to design more robust tracking, custom calendaring, goal setting and favoriting.